The Kasem Bible which has been 50 years in preparation is now being prepared for publication. A major milestone was reached at 11 am on Friday 22nd November when the text of the translation was “signed off” to say that no further changes would be made. 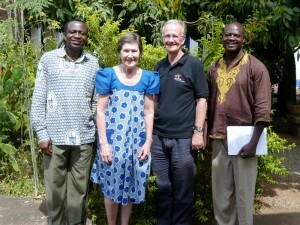 This took place at the GILLBT centre in Tamale, Ghana. 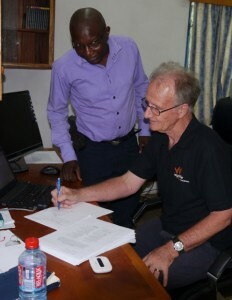 Printing proofs will now be prepared by John Sidsaya of GILLBT, and once approved by the translation team, these will be sent to printers in South Korea. The Bible will include book introductions, maps, a glossary with some pictures, as well as footnotes and cross-references. Other GILLBT staff gathered around as the signing off took place, praise was sung to God, and a prayer of thanksgiving was offered up. 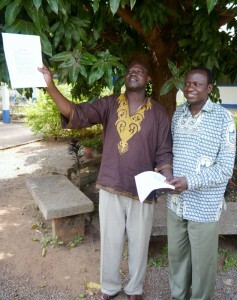 This was the first whole Bible to be prepared up to this stage in Ghana by John, so it was a very special occasion. Of those who joined in the celebration, several were working on the final stages of checking Bibles in their own languages, with the expectation of four further Bibles in Ghanaian languages being readied for printing during 2014. We rejoice to have reached this stage, and pray for God to watch over the remaining steps until the Bible is finally in the hands of Kasena people.